Our BEAUTIFUL, SPACIOUS 5 bedroom, 3 bathroom villa with private screened pool is just what you are looking for as your DREAM HOLIDAY HOME. Located at THE PALMS at LAKE DAVENPORT ESTATES you are close enough to escape the crowds at the theme parks to come HOME for a swim in your own private pool and return suitably refreshed to enjoy the rest of the day. Our home is fully furnished with 5 bedrooms, 3 bathrooms, open-plan family room overlooking the pool area, and fully equipped kitchen. There is also a breakfast nook and a separate dining room. There are tvs, dvd players, vcr & stereo cd system for your use. We have very recently added a games room with pool/air hockey table, foosball table, electronic dartboard and basketball machine. We also now have a computer with high speed broadband internet access and an x-box with a selection of games. 5 good sized bedrooms with 2 Queen size beds, 6 twin beds and 2 rollaway beds which can be placed to suit. 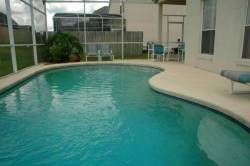 Our pool is west facing and enjoys the Florida sunshine from mid-day until sunset. The Master bedroom is on the ground floor, overlooks the pool area and has cable tv/dvd with over 90 channels, alarm clock, dressing table & ceiling fan. There is a large en-suite bathroom with garden tub, separate shower cubicle, his and hers vanity sinks with concealed mirror cupboards & hairdryer. There is a large walk-in closet and a separate toilet room. Also on the ground floor is a twin bedroom with large closet & a bathroom with shower cubicle and hairdryer. The PC and X-Box are in this room. On the first floor is a double bedroom with queen bed, ceiling fan, closet & 92 channel cable tv, and a further 2 bedrooms with walk-in closets and a bathroom with shower and hairdryer. The south west facing pool area enjoys the Florida sunshine from mid-morning until sunset and is screened for your comfort to keep out insects. There are sun loungers & a table & chairs for outdoor dining. The pool can be heated at additional cost, please enquire at time of booking.